Conditioner For Dogs - Colloidal Oatmeal & Honey Nourishes & Replenishes - Soothing To Calm Irritated Skin - Creamy Vanilla & Honey Scent - 13.5 oz --- We love our dogs as living members of our families. That's exactly why Petology exists and why, as professional pet care scientists, we designed our formulas around our dogs' unique biological grooming needs. Petology instantly delivers skin and coat health to make them look naturally beautiful. -- Everyone in your family deserves to look and feel their best, including your pets. And while we have lots of healthy hair and skin care products to choose from, our pets don't. Our concentrated natural ingredients, straight from the earth, are proven to improve the health, wellness and natural beauty of your dog's skin, coat and health. 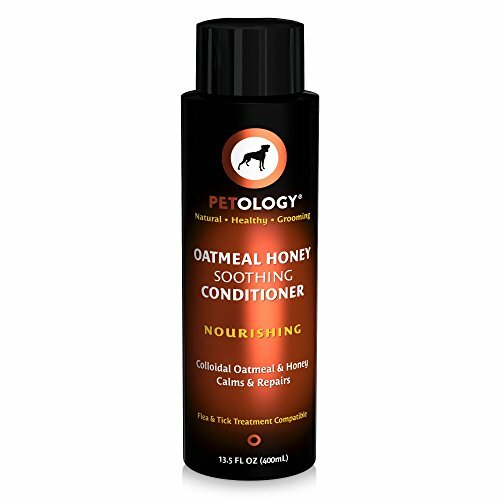 -- Petology's Oatmeal Honey Soothing Conditioner is a naturally soothing conditioning formula that combines the benefits of ultra-fine colloidal oatmeal and honey extract to calm irritated skin while providing superior moisture, luster and shine. It is infused with an advanced blend of botanicals and other mild ingredients with a creamy vanilla and honey scent that eliminates odors for days! -- NaturShine: Petology's patent canine sebum substitute keeps the skin pH balanced, forms a protective barrier for healthier skin and provides brilliant shine for beautiful coats. -- Vitacon: a patented vitamin complex of A, B-12, D, E, Green Tea and Chamomile that provides outstanding benefits to pets' skin. -- PMC (Plant Moisturizing Complex): a natural, plant-derived compound that provides instant, deep hydration and generates a moisture reservoir that lasts for up to 72 hours. If you have any questions about this product by Petology, contact us by completing and submitting the form below. If you are looking for a specif part number, please include it with your message.